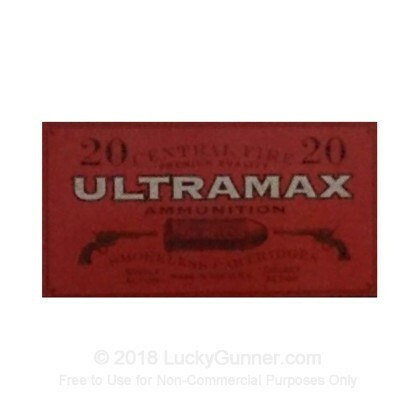 Complete with retro packaging, this .45-70 Government ammunition from Ultramax is an excellent choice for target shooting with vintage or new production rifles or handguns, from the Winchester Model 1873 to the Thompson Contender and the Magnum Research BFR. This ammo is made with modern conveniences including non-corrosive Boxer primers and smokeless powder for a vintage shooting experience that doesn't include the inconvenient parts! Each cartridge in this box of 20 fires a heavy 405 grain lead round nose bullet with a flat point at a muzzle velocity of 1,100 feet per second. This results in clean, visible holes in paper targets and good short to medium range performance. Expect relatively heavy recoil (more so in revolvers than long guns) and respectable accuracy at appropriate distances. Ultramax is an ammunition manufacturer based in Rapid City, South Dakota. Their ammo uses new production brass (as is the case with this load) or cleaned once fired cases. We don't have any reviews yet for this particular 45-70 ammo from Ultramax. If you'd like to be the first to review this particular 45-70 ammo from Ultramax, fill out the form below.